The Pontifical Institute for Foreign Missions (PIME) has developed a one-year, eight-part plan for personal and spiritual discernment called the Samuel Programme, which is aimed at Bangladeshi youth. Created in 2007, the programme is the brainchild of Fr Franco Cagnasso. Sister Annamaria Panza, of the Missionaries of the Immaculate Conception [MDL), a female congregation inspired by PIME, currently runs it. “The purpose of this programme is not to turn all young people into priests or nuns, but to help them understand that God has sent them into this world for a good reason,” Sister Annamaria told AsiaNew. Its goal is to help Catholic youth understand their vocation in their religious and marital life. The programme includes a number of meetings during the year. Usually the sisters invite local missionaries and others who work abroad in various parts of the world to speak and share their life experiences with frankness. The latter is the key to the success of the initiative, so much so that for many young people coming from the remotest parts of the country the programme has become a point of reference amid Dhaka’s chaotic life. 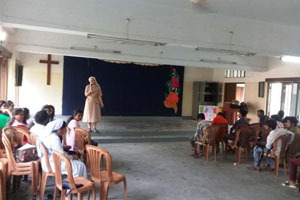 One of the eight meetings was held on 29 March at the Catholic church of Mirpur, founded by the PIME Fathers almost 26 years ago and handed over to the local archdiocese at the end of 2018. Some 53 college-level students, from local hostels, seminaries and novitiates, attended the event whose topic was prayer. Every year the programme organises a visit outside Dhaka to a charity, where people serve without personal interest. “We invite them to participate and often they continue to carry out works of charity in the family, even after the end of the course,” the nun said. Father Dominic Montu Hasda, who is an ethnic Santal, is a PIME missionary in Papua New Guinea. In his address, he spoke about the mission in that country, which has “a Christian majority, but has great need for missionaries for lack of local religious vocations”. Labanno Cruze, who joined an MDL school for nuns in 2017, said that she understood her “vocation thanks to this programme and realised the importance of prayer”.